MIT's Ed Boyden on thinking, taking notes and rebooting your failures. Ed Boyden once penned a short practical essay titled “How To Think,” and the passage above was his #1 rule. He was 28 years old and launching his own neuroscience research group at MIT. He’d already published findings that would win him the prestigious Brain Prize for helping to develop “arguably the most important technical advance in neuroscience in the past 40 years,” according to the chairman of the prize selection committee. That was nearly a decade ago. His system for generating ideas seems to have proven itself. Last year, in addition to winning the $3 million Breakthrough Prize, Boyden and colleagues unveiled a new method for observing the brain’s almost unimaginably small circuitry. The process is producing some of the deepest images of the brain ever recorded (see them in GIF form below). We spoke with Ed Boyden for Sophia, a project to collect life lessons from fascinating people. We wanted to know whether he’d updated his advice on thinking. We also asked about how he works, the most influential books he’s read, and the frontiers of knowledge he’s trying to reach next. You often say your goal is to “solve the brain.” How do you define that phrase? I think the definition will change as we learn more, but my working definition of solving the brain is: one, we can model, maybe in a computer, the processes that generate things like thoughts and feelings, and two, we can understand how to cure brain disorders, like Alzheimer’s and epilepsy. Those are my two driving goals. One is more human-condition oriented, and one more clinical. You could argue there’s this third question: What is consciousness? Why do we have experiences and, at least as far as we know, water bottles and pens and desks don’t? I worry that we don’t have a very good definition of consciousness yet which makes it hard to tackle. We don’t have a “consciousness meter” that’ll tell us exactly how conscious something is. I think we might get there eventually, but in the medium term, I like to focus on those first two questions. I’ll give you an example. When the 2008 economic crisis hit, I was talking to lots of people about why humans do the things that we do. Why are many of our decisions not the best decisions we could make? Of course, there is a whole field called behavioral economics that tries to explain why we do those things at a psychological and cognitive level. For example, if you give somebody a lot of questions to answer and then they walk by a bowl of candy, they are more likely to grab the candy because they’re tired out from answering questions and can’t resist. Behavioral economics can explain some things, but it’s hard to explain a lot of the underlying processes that generate these decisions, much less some of these unconscious things that we don’t have a handle on at all. Remember, when we’re conscious of something, that state is quite often generated by unconscious processes that happen right before it. So I would argue that if you understand how the cells of the brain are organized into circuits, almost computational circuits if you will, and we see how information flows through those circuits and how it’s transformed, we might have a much firmer grasp on why our brains make decisions the way that they do. If we get a handle on that, maybe we can overcome some of our limitations and at the very least we’ll understand why we do what we do. You can imagine over very long timescales, perhaps far beyond the multi-decade time scale, we might be able to ask very deep questions about why we feel the way we feel about things, or why we think of ourselves in certain ways ― questions that have been in the realm of psychology and philosophy but have been very difficult to get a firm mechanistic laws-of-physics grasp on. Crime Survivors Are Organizing. They Want Criminal Justice Reform, Too. One of the things that got me transitioning from physical science to brain science was asking, Why do we understand so much about the universe? It’s actually kind of weird that we can comprehend the law of gravity, or that we can understand quantum mechanics, enough at least to make computers. It’s surprising that the world is understandable to the extent that it is. So I started wondering, if our brain is understanding some parts of the universe and not understanding other parts, and those understandings are about the laws of physics that our brains are built on top of, then it’s kind of a loop, right? And I’m trying to figure out: How do you crack that loop? How do you actually make the universe more understandable? Suppose there are some things that we don’t understand about the universe, but if you understand human intelligence and you understand the gaps in our abilities to think about things, maybe we can engineer in a computer more advanced intelligences that can help augment our ability to think. It’s a concept that I sometimes call the brain coprocessor ― something that works with our brain and augments our ability to understand. There are many things that we still don’t understand about the universe, right? Einstein struggled to bring quantum mechanics and gravity together and never succeeded, and that’s a problem that to this day is not well understood. Well, maybe to comprehend some of these things, we need to augment our intelligence. If we do, who knows? There’s no guarantee, of course. But maybe we’ll understand more about how the universe came to be, and what forces drove it in the early days and which forces drive it now. Right now we are trying to map the circuits of the brain. The brain is really hard to see. The whole thing is very large ― the human brain is several pounds in weight ― but the connections between brain cells, known as synapses, are really tiny. They’re nanoscale in dimension. So if you want to see how the cells of the brain are connected in networks, you have to see those connections, those synapses. So how do you do that? Well, we developed a way of doing it. We take a preserved piece of brain tissue and infuse it with a chemical, a polymer actually, that’s very similar in some ways to the stuff in baby diapers. It’s a swellable polymer. If you form this swellable polymer inside the brain and then add water, you can actually move the molecules, the building blocks of the brain, apart from each other, and then you can see those tiny connections. Below, a new TED Talk by Ed Boyden on the process of blowing up brain tissue to study it in greater detail. So we’re thinking, with very small brains, like fish brains and worm brains, can we actually see the entire thing? Can we image the whole nervous system with a resolution of individual connections? This is just an idea right now, the technology isn’t there yet, but if we were able to perfect this technology, you could imagine mapping out a brain circuit with enough precision that you could simulate it in a computer. If you simulated it, would it mimic the organism from which it was mapped? Imagine we had a worm with 302 neurons and we mapped out the roughly 6000 connections between them and also the molecules at those connections. Could you then simulate what that worm is doing? Then maybe you go to the fish, maybe next comes the mouse, and then the human brain ― each of these brains is roughly 1000 times bigger than the previous one. If you could map out a human brain, an open question is, if you simulated it, would it be you? Now, as we discussed earlier, we don’t have a great definition or even a good technological handle to know whether something is conscious or not just by looking at it, so there’s that aspect that we’re not ready to answer, I would argue. But it raises very interesting questions about the nature of identity. About a decade ago, you wrote “How To Think.” Have you made any adjustments or additions to those rules? I wrote that essay pretty quickly back when I’d just started my research group at MIT and was mostly in an empty room, waiting for things to arrive. Since then I’ve really learned through experience how best to implement these things. I’ve also learned to really deconstruct the nature of problems. I gave a little talk earlier this year at the World Economic Forum in Davos. It’s called “Engineering Revolutions,” about how to think more deeply about problems and also how to make it feasible to tackle them. That was kind of like How To Think 2.0, except in video form. What are some books that had a major impact on your intellectual development? 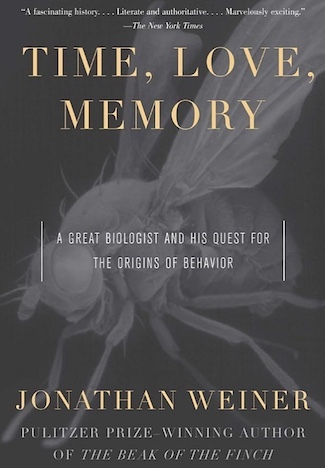 One was “Time Love Memory.” It’s about the dawn of people linking genes to behavior. It starts with the dawn of the genetic age ― when people found that X-rays changed genes ― and it goes all the way to the modern era, where people are figuring out which genes adapt things like our sense of time or our ability to remember certain things. I love it because it shows science in action ― not like a textbook, “here’s facts 7 through 48 and you remember them” ― it shows people struggling with ambiguity and wrestling with all sorts of difficulty, and it’s very entertaining. For a while I would read that every year, once a year. It had a big influence on me. The second book is titled “Thinking About Science.” It’s about Max Delbrück, who also was a physicist who transitioned into biology. He played a big role in discovering the structures of genes and really helped launch the modern era of molecular biology. It talks a lot about his perspective and how he thought about his drifting from physics into biology. That was also very influential in my life as I try and think about how to go after complex systems like the brain, but to get down to the ground truth, to not make approximations, to not settle for a partial answer. You describe yourself as a compulsive notetaker. What’s your system? When I’m talking to somebody, I’ll put a piece of paper on the table and I’ll write what I call a conversation summary ― notes about the conversation on the piece of paper. At the end of the conversation, I’ll take a picture on my phone and give the other person the original piece of paper. Every month or so I’ll go back through all those conversation summaries and tag them on my laptop with keywords. That serves two purposes. First of all, because I revisited the conversation, it helps me remember it. Secondly, because I keyword tag it, it becomes searchable. By this point, I’ve done that for many tens of thousands of conversation summaries over the years. Your job involves a fair amount of time devoted specifically to thinking. How do you get the most out of that time? Three points, from the pragmatic to the abstract. One thing that I’ve been doing for a long time is to wake up really early. I try to get up around 4 or 5 in the morning, long before most of my lab members are up, which gives me some quiet time to really think without distraction. I think that’s important. Secondly, a lot of good ideas are actually bad ideas because, since they sound good, everybody’s already doing them. So I often try to think about, What sounds like a bad idea, but if you find the right plan of attack, it’s actually a really good idea? I spend a lot of time really trying to systematically tackle problems from different angles. Fritz Zwicky was an astrophysicist who thought up a lot of ideas decades and decades ago that nowadays are amongst the hot topics in astrophysics. Ideas like dark matter and so forth, which are now the cutting edge of the cutting edge, he thought them up in the 1930s. The way that he did it was by simply trying to think of every possible idea. He called it morphological analysis, which I think is a bit of a mouthful, so I started to call it the “tiling tree method.” It’s easiest to describe with a picture. If you take a look at my World Economic Forum talk, I actually go through an example of trying to think of every possible way to build an energy system ― renewable vs. non-renewable, and the non-renewable is solar vs. non-solar, and if you keep splitting the categories of ideas into smaller and smaller categories, you can actually kind of think of every possible idea. So the Zwicky method is one that I practice a lot. Finally, even more abstractly, I really try to make my schedule safe for serendipity. I spend a lot of time going over old conversation summaries. A lot of the old ones are about ideas that ended in failure, the project didn’t work. But hey, you know what? That was five years ago, and now computers are faster, or some new information has come along, the world is different. So we’re able to reboot the project. Many of the projects that we do that appear quite successful, it’s actually often the second or third time we’ve given it a try. A big part of my job is to remember failure, and reboot failure, when the timing is right. The major prizes you’ve been awarded honor your role in the development of optogenetics. What makes it such an important advancement? So, optogenetics, that’s “opto” meaning light and “genetics” because we use a gene to do the job. The way it works is, you put in a gene that encodes for a little solar panel, essentially ― a molecule that converts light into electricity. Now, neurons compute using electricity. So if you put that molecule into a neuron and shine light on it, you can control that neuron’s activity. Now why is that important? Well, for the last century of neuroscience, lots of people have tried to control neurons using all sorts of different technologies ― pharmacology (drugs), electrical pulses, and so on. But none of these technologies are precise. With optogenetics, we can aim light at a single cell, or a set of cells, and turn just that set of cells on or off. Well, why is that important? If you can turn cells on, you can figure out what they’re important for. Maybe they trigger a sensation or a decision or a movement. If you turn off cells, you can figure out what they’re needed for ― maybe you turn off a certain set of a cells and a memory vanishes, which people have done. Optogenetics is now ubiquitous in the study of the brain, used in labs all over the world. What are some of the most interesting or promising applications that you’re aware of? People have done some very philosophically provocative experiments. A group in CalTech found a small cluster of brain cells, deep deep in the brain. If you activate them in light in a mouse, for example, which a lot of neuroscientists work with, then these mice become aggressive, even violent. They’ll attack whatever’s next to them, even random things like a glove. This is very interesting because now you can ask questions like, What is happening when you trigger these cells? Is it triggering a motor command? I.e., the mouse moves to attack? Or is it triggering a sensory command? I.e., the mouse is afraid and attacks out of self-defense? You can really start to ask questions about what it means when a part of the brain triggers something as complex as aggression or violence. Then, there’s a whole field where people are activating or silencing neural activities in different parts of the brain and trying to achieve a clinical goal. There’s a group that’s shown in certain mouse models of epilepsy that they can turn off a seizure by turning off certain cells. There are groups that have stimulated certain pathways in the brain in mouse models of Parkinson’s disease and been able to turn off the Parkinson’s symptoms. People have done all sorts of interesting things in basic sciences as well. My MIT colleague Susumu Tonegawa’s group did something very clever; they engineered mice so that neurons that are involved with memory become light-activatable. They found out that if you reactivate those neurons with a pulse of light, the mouse acts like it’s remembering that memory. Now you can pinpoint sets of cells in the brain that can cause a memory to come back into mind. They’ve done all sorts of interesting things since then, like they can activate a happy memory and a mouse will feel better, even to the point of overcoming clinically-relevant poor mood. The list goes on and on. Have you had any recent realizations about living a more satisfying life? I’ve realized that if I really want to get these brain technologies out into the world, I have to help with entrepreneurship, with starting companies and helping these inventions leave academia. My lab has certainly spun out companies before, but I never played that major a role in them. But this year I’m helping start three companies. My hope is to really try to figure out how we can get these technologies out there to really help people. I realized that I didn’t just want to publish manuscripts, but I wanted to get these technologies out there and into the real world. One of these new companies is focused on the brain expansion technology, right? That’s right. We started a small company called Expansion Technologies, and the goal is to get the expansion technology out into the world. People can use it based upon our published papers, but if we can help people deploy it en masse, then we can essentially help solve a lot of scientific as well as medical problems. Just to be upfront, all the protocols for expansion microscopy are online and we share all the knowledge freely. We’ve probably taught well over 100 research groups how to do it. Anybody can implement expansion microscopy by themselves if they want to. But unlike optogenetics, where there are existing nonprofits that give away the DNA for free or at cost, expansion microscopy requires chemicals to be used, so having a company that makes the chemistry kit that anybody can use can save time. We’re always just trying to help maximize positive impact on the world. We often begin a project by thinking, What’s a problem that thousands and thousands of research groups or companies or universities have? And then we try to build a tool that they would all want. So, almost by definition, if we succeed, it makes no sense to keep it only for ourselves. We’re just trying to get all of our tools into as many hands as possible.